BestNess is a Smash 4 Ness player from Utah who is currently considered to be the best Ness player in the world. BestNess is currently ranked 1st on the Utah Power Rankings. He is also known for his doubles prowess with Diablo, placing 5th at GTX 2017, and 7th at The Big House 7. 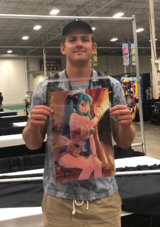 He has taken sets off of top players such as ANTi, Shuton, Elegant, Vinnie, Darkshad, Light, Shoyo James, Zenyou, Charlie, JK, and Captain L.
This page was last edited on April 14, 2019, at 16:11.